Sometimes a second chance is your first shot at happiness. Casie Carmichael is hardworking but softhearted. She has a broken-down mare, two baby lambs, three lost teens, a busted-up bronc rider, and a whole lot of trouble. 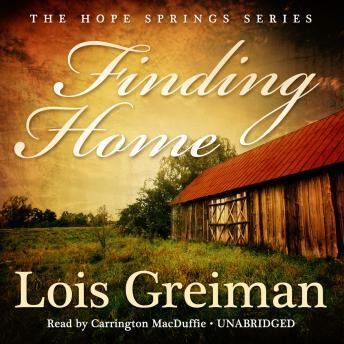 Casie has returned home to Hope Springs, South Dakota, to sell the family's tumbledown ranch with the hope of returning to Sioux Falls and her very practical fiancé. But leaving Hope Springs isn't quite as easy as she thought it would be, especially since her barn seems to have a homing beacon leading every bedraggled stray in the territory straight to it. Casie must deal with angry parents, hairless goats, and a former flame's new heat-but these are nothing when compared to her own mixed-up heart. As Casie tries to make a safe haven for her motley crew, she realizes that she is home, for good and all.